Fine white 18 micron Merino wool. Falkland Merino 100,s 18 micron. Better than our usual South American merino being from the Falklands. Its always whiter than other wools with a good handle. Whilst not organic certified it is not subject to the same use of insecticides on the Falklands as very little if any is used. Always non mulesed as they dont have the fly problems of other countries. 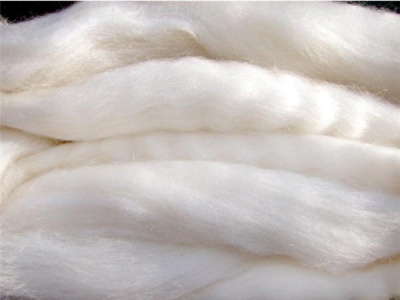 This fine white Merino is suitable for hand spinning, felting and dying. It can also be blended or carded with other fibres to your own design. This is a very soft merino, giving a super-soft handle, making it ideal for those who may find standard grade wools a little "itchy" or for more sensitive skin. It is a fraction coarser than cashmere but a lot cheaper if you are looking for a fine handle. Due to it's quality this wool will felt very easily, though the trade off is that it is not very hard-wearing. It's also easy to overwork it when felting, leading to surface piling. We suggest it's kept for adding those final flourishes on felted work.